Home Pregnancy Tests Pregnancy Test FAQs Pregnancy Symptoms But Negative Pregnancy Test? When you have pregnancy symptoms but negative pregnancy test you start panicking. Worrying doesn’t benefit and become more anxious and feel low. After feeling confident that you are pregnant seeing early pregnancy signs negative pregnancy test stresses you. Stress in itself delays the period and might even affect early pregnancy. 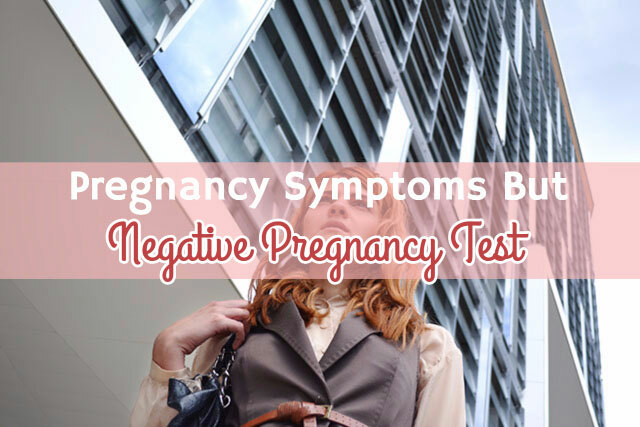 It is best to repeat a test when you have pregnancy symptoms but negative pregnancy test. Seeing pregnancy symptoms like nausea and constipation can make any woman believe that she is pregnant. It is difficult to understand whether you are experiencing is PMS or early pregnancy signs. You might take a pregnancy test to confirm your pregnancy. But if you get negative pregnancy test no period, then you cannot conclude. Is it possible to be pregnant and have a negative pregnancy test? Am I pregnant or not? Why does the test keep being negative? Is it possible that pregnancy tests fail? Can you be pregnant and still get a negative pregnancy test? Could it be false negative pregnancy test? Pregnancy symptoms such as cramps overlap with PMS. It is possible that your late period is making you feel bloated, nauseated and cramping. Often our readers tell us a list of early pregnancy symptoms they are experiencing and a negative pregnancy test. One reason could be that your hCG levels, unlike other women, are taking time to rise. In that case, you’re pregnant and thus experiencing the signs of pregnancy. The other case is when you’re misinterpreting the symptoms of other problems as early pregnancy signs. It is very rare that signs of pregnancy but negative pregnancy test continue for long. There are reports of cryptic pregnancy when the woman comes to know that she was pregnant only when she goes into labor. The pregnant woman continues to feel that she is pregnant and has symptoms. The hCG levels are undetectable, and pregnancy only confirms when she has the labor pain. The opposite is the case where the woman believes that she is pregnant and goes into labor despite she is not. The condition is pseudocyesis. Primarily a mental disorder but again a case of signs of pregnancy but negative pregnancy test. At times while TTC the desire to be a mother becomes overpowering. The overwhelming emotions attached make you feel and interpret everything in light of being pregnant. Gassy stomach feels like implantation cramps and genuine exhaustion as unexplained fatigue. It’s not something to feel embarrassed about but needs a check. Before you go to the doctor, wait for few days to repeat the test. There could be a miscalculation because you may expect your period earlier. When you have had a busy month, you may have delayed ovulation. In that case, you’ll get your period late and negative pregnancy test. Another possibility is that you are using a box of expired pregnancy tests. Not following the pregnancy test instructions can also cause a false negative pregnancy test. Negative pregnancy test for long could mean that you are not pregnant. Cramps no period negative pregnancy test is not necessarily because you are pregnant. Nonetheless, you could have an Ectopic pregnancy. In that case, you need medical attention as it can harm your health and cause complication for future. If the test keeps being negative, then you are most likely not pregnant. Any woman after getting a negative pregnancy test will be more cautious next time. Unless you are using an expired pregnancy test, then you are not pregnant. There are many reasons for a period late negative pregnancy test. Simple illnesses like flu and cold can delay ovulation. But if you have pregnancy symptoms, then you may think that the pregnancy test is wrong. You can’t say this unless you confirm your pregnancy. The occurrence of pregnancy symptoms is not enough for considering yourself pregnant. Early pregnancy symptoms are ambiguous and are similar to PMS. Frequent urge to pee could be because of any medications. Mood swings have reasons more than we can cover. If you repeat a pregnancy test and yet get a negative pregnancy test, then you may lose hope. If I feel pregnant why all tests say negative? It’s like that pregnancy tests are conspiring against you. But all pregnancy tests cannot be wrong. If you continue to make a mistake during pregnancy test, then you need to take hospital pregnancy test. Another case could be that you take a pregnancy test at the wrong time. Pregnancy Test at night or morning is a significant factor in deciding the accuracy. A sensitive pregnancy test is also essential for detecting early pregnancy test. Having no period but the negative pregnancy test is a strange condition. There can be many reasons for causing pregnancy like symptoms. The false symptoms mimic pregnancy. You have nausea, sore breasts and missed period but negative pregnancy test. When you don’t see the desired results, you start misjudging signs. All women are different. Most women take about a week to reach a sufficient level of hCG in urine. But there could be cases when someone takes longer than that. There is no problem if you get a positive pregnancy test at 3 weeks. Low hormone levels are a sign that your hCG is not doubling within 48 hours. You will have pregnancy symptoms but negative pregnancy test. If the hCG hormone is not enough even most sensitive pregnancy test won’t be able to detect pregnancy. During breastfeeding, the menstrual cycle ceases, and so you don’t get a period. During pregnancy a phenomenon called Lactational Amenorrhea takes place. You may feel nausea and other pregnancy symptoms because your body is changing. In this case, you will get no period negative pregnancy test. Some women feel that they are pregnant soon after childbirth during breastfeeding. But the symptoms are because of breastfeeding and not pregnancy. Certain medications like anti-seizure drugs and antiepileptic drugs can cause a false negative pregnancy test. A woman has pregnancy symptoms but negative pregnancy test because of medications. If you are taking antidepressants before pregnancy, you need to talk to your doctor about it. Dealing with depression while pregnant is a critical subject. Ectopic pregnancy is the result of the embryo implanting in the tubes instead of the uterus. Ectopic pregnancy has pregnancy symptoms but negative pregnancy test. The hCG levels are low. You will have symptoms like dizziness, nausea, and cramps. The hCG levels will not double rapidly, and so you will get a negative pregnancy test. Using a less sensitive pregnancy test doesn’t allow you to test early. Pregnancy symptoms but negative pregnancy test can be because the kit is incompetent. Signs of pregnancy may start early in case of some women. So it is not essential that your pregnancy test can detect pregnancy that early. It is essential that you check the sensitivity of the pregnancy test while buying one. Ovarian cysts or any other illness can cause no period. Pregnancy symptoms like cramps and nausea are common to these diseases. Getting pregnancy symptoms but the negative pregnancy test is a sign that something is wrong. You need to tell your doctor if you continue to get a negative pregnancy test. A defective pregnancy test cannot detect pregnancy because it lacks the required components. Expired pregnancy test has lost the functioning and later won’t be able to detect pregnancy. Using either defective or expired pregnancy test will give false negative pregnancy test. A dilute urine sample has low levels of hCG. During early pregnancy, your body doesn’t have enough hCG. Early morning urine has a higher level of hCG because overnight kidneys reabsorb the water. This is why it is best to take the pregnancy test in the morning. When you test too early soon after implantation, you can get a false negative pregnancy test. If you don’t follow pregnancy test instructions, then you can get a false negative pregnancy test. Pregnancy symptoms but negative pregnancy test is a sign that you are not following the instructions. Every pregnancy test is different, and you need to follow the instructions correctly. Any lifestyle changes or habits can cause pregnancy symptoms but negative pregnancy test. If you are under stress, your period will be late. Stress also reduces the chances of getting pregnant. If you do not have a healthy diet, then you will not ovulate at the right time. The post-implantation events can be unsuccessful. A very early miscarriage will not allow you even to know that you were pregnant. Only a doctor will be able to tell you that your hCG levels were higher than normal. Nausea and other pregnancy symptoms with negative pregnancy test could be because of another disease. A false negative pregnancy test is very common when you take a pregnancy test too early. A false negative pregnancy test will go away with time when you repeat the test. Yes, it is very likely that pregnancy test fails. It is when you don’t follow the instructions. It could also be that you are using an expired pregnancy test. You might not want to hear this, but it could be because you are not pregnant. No period and pregnancy symptoms are not enough of a proof of pregnancy. Many other diseases have similar signs and can delay period. False negative pregnancy tests do occur when you make mistakes. Expired or defective pregnancy tests also give false tests. I have nausea and sore breasts could I be pregnant? That’s one of the most common FAQs. Yes, you could be pregnant, but your pregnancy test will show that soon. If it doesn’t happen, then most likely, you’re not pregnant and need to consult a doctor.